Uruguayan National Navy confirmed the sinking of the very large ore carrier Stellar Daily in South Atlantic. Two Filipino seamen were rescued from a life raft near the accident site, but another 22 crew were unaccounted and reported as missing. During the search and rescue operation, the Uruguayan National Navy found strong smell of fuel and debris floating near the alleged accident site. Also near the accident side were found other lifeboats and rafts, which were empty. The search and rescue operation for the missing seamen continue, as the South Korean Foreign Ministry asked Brazil and Uruguay to help. This morning the SAR operations will strengthen with a Brazilian aviation aircraft, which will allow covering of larger area. “A search operation is continuing for the 22 people”, said the South Korean foreign ministry official in Seoul to local news media Yonhap, adding that eight of the missing are South Korean nationals and 14 are Filipinos. “South Korea has requested Brazil and Uruguay to aid in the search and rescue”, added the official. 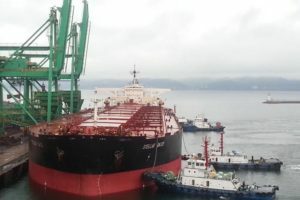 The very large ore carrier Stellar Daisy was sailing from Brazil to China, carrying iron ore, when it sent a distress signal to the ship operator on Friday. The vessel is owned and operated by South Korea’s Polaris Shipping.